We start on Advent Sunday, 2ndDec 6.30pm, with the Advent Carol Service, benefiting from the thousands of lights in the Celebration of Light (click here for more info), which emphasise the Advent theme of light in darkness, hope in despair, and a new relationship with God in Christ. The Family Service on 9thDec will continue the theme of light, with crafts for children before the service, as usual. Our traditional Nine Lessons & Carols on Sun 23rdDec 6.30pm will include the story of the fall of humanity, the promise of the Messiah, and the birth of Jesus, told in nine short Bible readings from Genesis, the prophetic books and the Gospels, interspersed with the singing of Christmas carols, hymns and choir music. Our two Crib Services on Mon 24thDec 3pm and 4.30pm are aimed at children and their parents or carers, telling the Christmas story, dressing the church crib scene and singing children’s carols; a warm and friendly way to start Christmas! All are welcome, you don’t have to bring a child! 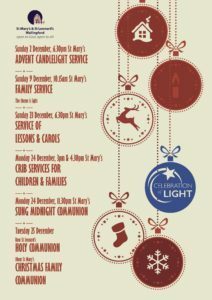 Then we arrive at Christmas Day and we have three services to offer. The first is sung Midnight Communion, entering the church at 23:30 on Mon 24th Dec, we walk out into Christmas Day. Then on Christmas Day itself there is Holy Communion at St Leonard’s at 8am and a Christmas Family Communion in St Mary’s at 10am. Join Jane Williams on a journey from Advent to Epiphany, and discover the timeless wisdom to be found in some of the world’s greatest paintings. Illustrated in full colour with nearly forty famous and lesser-known masterpieces of Western art, this beautiful book will lead you into a deeply prayerful response to all that these paintings convey to the discerning eye. The services will last around 30 minutes. All are very welcome to attend what should be a thought provoking and helpful preparation for Christmas.